Find this book at Amazon.com | buch7.de | eurobuch.com | buchhandel.de | books.google.com ASIN=0691090742, Category: Science, Language: E, cover: PB, pages: 536, year: 2001. 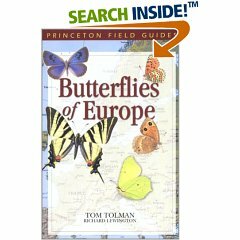 This is the most comprehensive field guide to the butterflies of Europe. The magnificent color illustrations and succinct entries cover all 440 species across, and sometimes beyond, the continent--from Lapland to North Africa, from the British Isles to Portugal to Greece, from the Pyrenees to the Caucasus. Completely up-to-date, the book includes dozens of species absent in earlier guides and covers the Canary Islands, the Azores, Madeira, and the Aegean Islands, home to several butterflies found nowhere else in Europe. The entries cover taxonomic nomenclature, range, distribution, description, flight period, variation, habitat, life history--including, importantly, larval host plants--and behavior. The 104 color plates feature over 2,000 illustrations, including both genders of each species and lateral views. Distribution maps accompany nearly all entries. In this journey to the haunts of the Old World's most kaleidoscopic creatures we encounter: Swallowtails and Festoons, Orange Tips, Hairstreaks and Blues, Emperors and Tortoiseshells, Fritillaries, Ringlets, Skippers, and many other delicately winged delights. All who find butterflies beautiful will treasure this authoritative guide. Whether already afield or still at home dreaming of that trip to Europe, they will feel what the great literary lepidopterist, Vladimir Nabokov, did as a schoolboy in Russia, when, as he once recounted, he so yearned to identify one of those "delicate little creatures that cling in the daytime to speckled surfaces, with which their flat wings and turned-up abdomens blend."